Vitamin A is found in two primary forms: active Vitamin A and beta carotene. Active Vitamin A comes from animal-derived foods and is called retinol. This “pre-formed” Vitamin A can be used directly by the body; it does not need to first convert the Vitamin. The other type of Vitamin A, which is obtained from colorful fruits and vegetables, is in the form of “pro Vitamin A” carotenoids, which are converted to retinol by the body after the food is ingested. Beta carotene, a type of carotenoid which is found primarily in plants, needs to first be converted to active Vitamin A in order to be utilized by the body. Studies have repeatedly shown that antioxidants like Vitamin A are vital to good health and longevity; they benefit eye health, boost immunity, and foster cell growth. Nutrition experts and physicians recommend obtaining antioxidants like Vitamin A primarily by eating a well-balanced diet high in fruits, vegetables, and whole foods whenever possible, rather than from supplements. Vitamin A is essential for normal vision, as well as proper bone growth, healthy skin, and protection of the mucous membranes of the digestive, respiratory, and urinary tracts against infection. People with long-term malabsorption of fats are very susceptible to developing a Vitamin A deficiency. The most common health concerns that will cause malabsorption of vitamin A include gluten sensitivity issues, a leaky gut syndrome and auto immune responses, inflammatory bowel disease, and pancreatic disorders. Alcoholics, whose excess toxicity creates low vitamin A levels, are also at a much higher risk fr deficiency. Vitamin A deficiency has become a public health problem in more than half of all countries, especially in Africa and South-East Asia, especially affecting young children and pregnant women in low-income countries. This can be a serious problem for children because the lack of vitamin A causes severe visual impairment and blindness; it also increases the risk of severe illness, and even death, significantly. Children may be in harm’s way from such common childhood infections as diarrhoeal disease and measles. Your eyesight may be followed by wrinkling, cloudiness, and a softening of the corneas. If the corneas continue to soften, without adequate attention and treatment, this may lead to infected corneas, a rupture, or degenerative tissue changes- all can cause blindness. Respiratory infections can occur because the body’s immunity is impaired by the lack of vitamin A. The younger the patient, the more severe the effects can be. Growth retardation and infections are common among children, and the mortality rate can reportedly exceed 50% in children with severe vitamin A deficiency. Vitamin A is a critical part of the rhodopsin molecule, which is activated when light shines on the retina, and it sends a signal to the brain, which results in vision. Beta carotene, the form of vitamin A found in plants, plays a role in preventing macular degeneration, the leading cause of age-related blindness. Studies also show that vitamin A eye drops are effective for the treatment of dry eyes. One study found that over-the-counter lubricating eye drops containing vitamin A were as effective for the treatment of dry eye syndrome as more expensive prescription eye drops formulated for dry eye relief. Another study was done in early 2011, by researchers at Columbia University Medical Center in New York; they found that a synthetic, altered form of vitamin A might be able to slow the progression of Stargardt’s disease, an inherited eye disease that causes severe vision loss in young people. Several immune system functions are dependent on sufficient vitamin A, which is why it is known as an important immune booting vitamin. Genes involved in immune responses are regulated by Vitamin A, which means it is essential for fighting serious conditions like cancer and autoimmune diseases, but also illnesses like the flu or common colds. 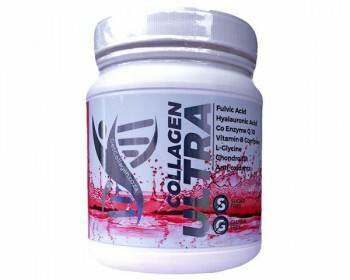 Vitamin A has antioxidant properties that neutralize free radicals in the body that cause tissue and cellular damage. Vitamin A can prevent the cells from becoming overactive. When the immune system overreacts to food proteins, this is what creates food allergies and eventually inflammation. Vitamin A intake can help to lower the risk of certain types of food allergies because it helps to prevent this dangerous overreaction. Vitamin A is necessary for wound healing and skin re-growth. It is needed to support all of the epithelial (skin) cells both internally and externally and is a powerful aid in fighting skin cancer. Vitamin is needed to form glycoproteins, a combination of sugar and protein, which help the cells bind together forming soft tissues. A deficiency of vitamin A can lead to a poor complexion, as indicated by studies that prove that vitamin A can fight acne and improve overall skin health. Vitamin A keeps the lines and wrinkles in your skin away by producing more collagen, which is responsible for keeping the skin looking young. Vitamin A can also contribute to healthy hair. 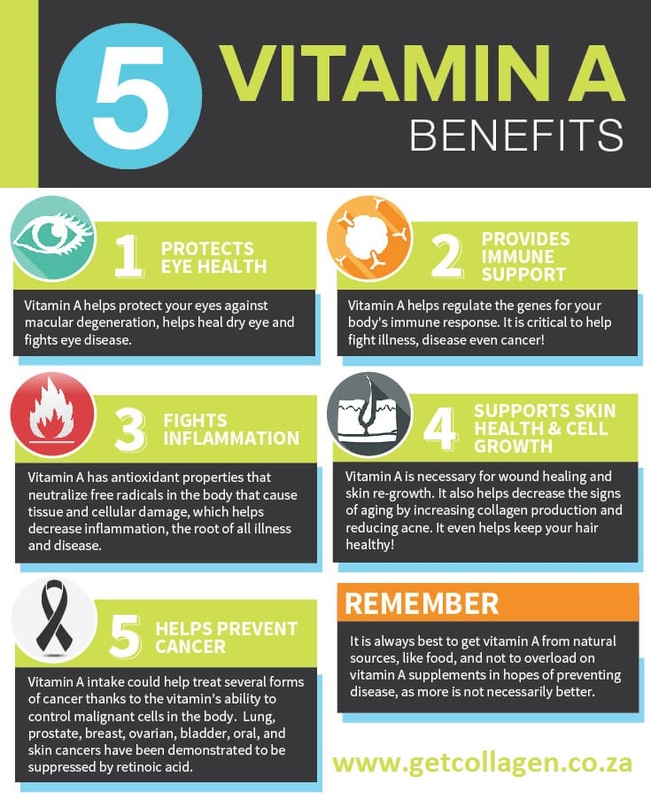 According to a study conducted at the University of York, vitamin A intake could help treat several forms of cancer thanks to the vitamin’s ability to control malignant cells in the body. It is currently understood that retinoic acid plays important roles in cell development and differentiation as well as cancer treatment. Lung, prostate, breast, ovarian, bladder, oral, and skin cancers have been demonstrated to be suppressed by retinoic acid. Another study collected numerous references demonstrating the findings of retinoic acid in melanoma, hepatoma, lung cancer, breast cancer, and prostate cancer. Researchers found new evidence indicating that the molecular mechanisms in retinoic acid may control cancer cells’ fates. Keep in mind it is always best to get vitamin A from natural sources, like food, and not to overload on vitamin A supplements in hopes of preventing disease, as more is not necessarily better. Here are some of the best sources of Vitamin A. For more information on source of Vitamin A, check out my list of the Top Vitamin A Foods. High doses of vitamin A may actually do more harm than good. 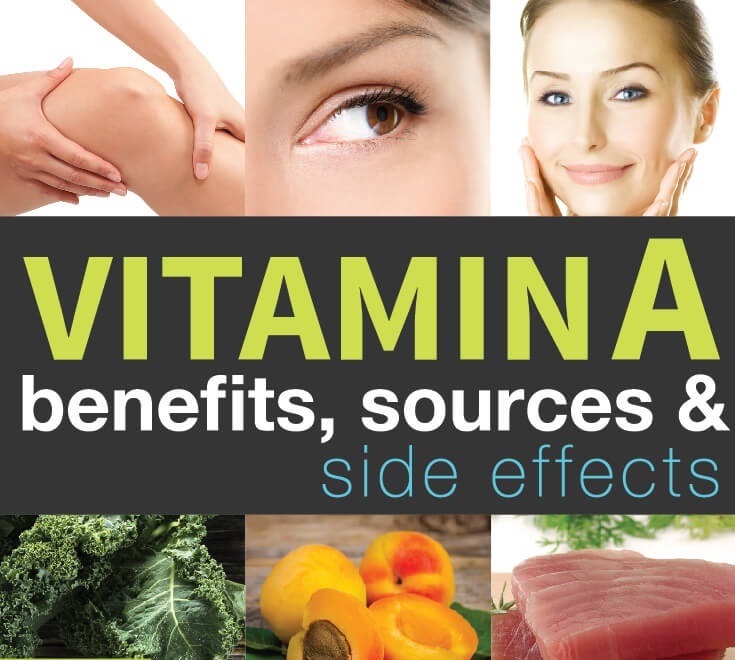 Consuming too much Vitamin A from supplementation alone, or in combination with other antioxidants, has been associated with birth defects, lower bone density, and liver problems. Over consumption of vitamin A can lead to jaundice, nausea, loss of appetite, irritability, vomiting, and even hair loss. If you are going to consume Vitamin A supplements, make sure to take lower doses, use supplements from food based sources, and consult your doctor. People who drink heavily or have kidney or liver disease also should not take vitamin A supplements without talking to a doctor. Symptoms of vitamin A toxicity include dry skin, joint pain, vomiting, headaches, and confusion. Vitamin A supplements may interact with some birth control pills, blood thinners (like Coumadin), acne medicines (like Accutane), cancer treatments, and many other drugs. 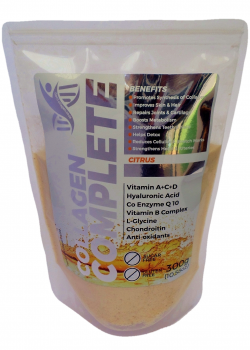 Vitamin A is a fat soluble vitamin, and therefore, needs to be consumed with fat in order to have optimal absorption. A sufficient dietary intake of protein is required for the manufacture of these binding proteins, so inadequate protein intake may result in vitamin A deficiency. Studies have shown that the absorption, metabolism, hepatic release, transport, and tissue utilization of vitamin A may depend, in part, on an adequate zinc status. A study on animals found that a zinc deficiency could both precipitate health consequences associated with both zinc deficiency and, through its gatekeeping roles, impose a secondary vitamin A deficiency. Zinc deficiency might also limit the health and nutritional effect of vitamin A interventions on issues like night blindness. Recent studies suggest that the results of a vitamin D deficiency may be worsened by high supplemental intake of vitamin A. These studies reveal that when blood levels of vitamin D fall below 50 nanomoles per liter, higher supplemental intake of vitamin A can worsen problems related to this vitamin D deficiency, like bone health. When vitamin A and D levels are sufficient, research has shown that they work together to help your body metabolize the vitamins.